Caserio El Olivo is a very spacious penthouse apartment over the entire top floor of a large Andalusian country house set in absolute natural tranquility. This is located in a lush and beautiful property surrounded by nature in an authentic Mediterranean setting. The whole property is 3000 sqm and is organic-certificated. The garden contains various orange, avocado and centenarian olive trees and many other Mediterranean fruit trees. The property is only 1km away from town (10-15 minutes walking distance) but it still provides with all the quietness and tranquility of pure nature to make your holiday as pleasant and relaxing as possible. The apartment Caserio El Olivo is also characterised by its large and bright interiors, especially the wide and open living room and the bright spacious bedrooms – which have one bathroom attached to each. Both bedrooms and the living room have direct access to a huge and beautiful sunny terrace with great views over the garden, the valley and the mountains. Everything is tastefully decorated, fully and well-furnished and very well equipped. The house contains all you need (for example, sharp kitchen knives, large red wine glasses, high quality mattresses, bed linens and towels). The shared saline-swimming pool produces a natural alternative to chlorine; it is 9 x 4m and incorporates a shallow toddler section. The pool is situated within a lawned garden and is surrounded by a child-safety wooden fence. These precautions will certainly guarantee a restful, fun and relaxing holiday for the whole family. I live in the lower ground floor and I will take into account the peace and privacy of our guests. I will also be totally available to help out with any queries, suggestions, ideas and touristic information when necessary. In the lower part there is a small studio as well, which is also for rent. This gives the option to rent the studio and the penthouse all together for more than 4 travelers. The property also houses another small holiday home, on the other end of the land, which is also for rent. The pool area and the playground area are shared by all holiday properties on the land. And all do have their own terrace, garden and barbecue. 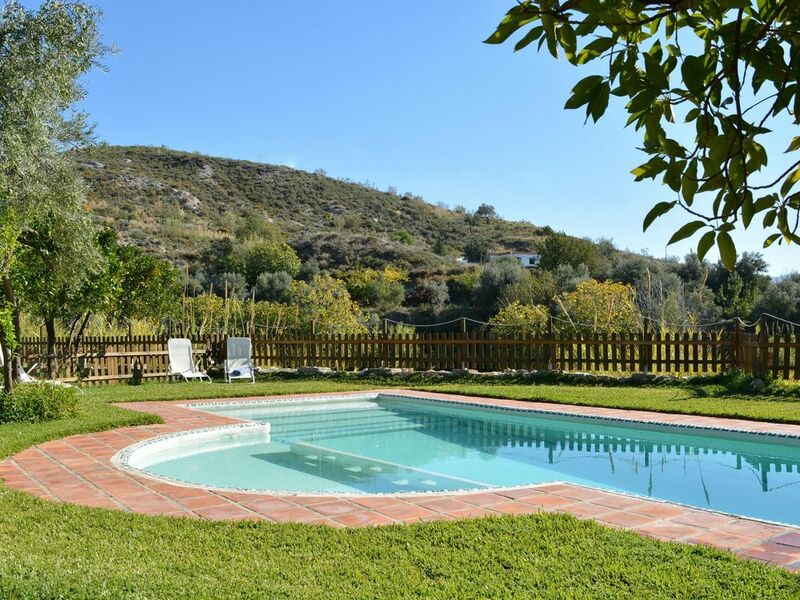 The property is located in the heart of the Alpujarra, the green and lush south slopes of Sierra Nevada with its breathtaking landscapes and mild and sunny microclimate all year round. You will have the perfect opportunity to experience and enjoy the authentic and genuine Andalucía intimately, away from the busy tourist spots. Straight from the house, you can enjoy wonderful walks through the valley or up to the hills. By car, you can have amazing excursions to the high part of the 'Las Alpujarras' with its white and picturesque mountain villages and do hikes into the canyons, visit small wine presses and wine cellars or clime the snow-covered peaks of Sierra Nevada. The mountain chain reaches an altitude of 3484m and is replete with a unique wildlife, beautiful rivers and pristine lagoons. The house is only 25 minutes driving distance to the coast, 40 minutes to Granada (one of the most beautiful and lively historic and cultural cities in the world) and little over than one hour to Sierra Nevada ski resorts. Our property is a lawful family-tourism business which is registered and monitored by the Spanish Tourism Authority “Consejería de Turismo y Deporte” and guarantees the highest standards for equipment, safety, hygiene and general quality. It also has the official Andalusian seal AGROCOLOR as an organic olive and orange farm. A personalized reception (also possible at a meeting point in the village) and introduction to the property. I came across the Alpujarras by chance during my journey through Spain in the mid 80's. This was about the same time as the famous book writer Chris Stewart arrived into the area. Years later he published his bestseller ‘Driving Over Lemons: An Optimist in Andalucia (The Lemons Trilogy)’ where he tells all these funny tales and amazing experiences he had in this very region. I also discovered the same sort of authentic unspoiled paradise as he did. Back then, south of Granada was very different to what it is now. The area was impoverished, there were not many cars around but lots of donkeys instead, TV was a novelty and people actually 'lived' in the bars. There was no VAT tax yet and no motorway for hundreds of miles. Granada was a day's journey away and northern Europe a different planet. I was in heaven. I’ve been living in this area for almost 30 years and my children were born and grew up here. I absolutely love this region. Since then, I've been exploring the many things this area has to offer: hiking, skiing, cycling, snorkeling, biking, cooking, climbing and partying, of course. After now living here over 25 years it is still our paradise on earth! The penthouse is very well prepared, fully equipped and comes with all inclusive. Once you are here everything will suit your requirements and you will be enjoying a relaxing holiday right from the first moment. In the area there are many things to do and to explore and it would be a pleasure for us to offer all the experience we have gathered in the 30 years we have lived here. We can give you practical tips and advice about all the activities you can enjoy in the region. In the house you will find a detailed information brochure including road, street and hiking maps and helpful suggestions and descriptions about walks, hikes, nice car rides, beaches, restaurants, shopping, cultural events, ticket bookings, etc. If you might already have some questions. You will find most information on the Hospitality App of HomeAway on your mobile. If you have any specific questions regarding your stay or any other detail, please don't hesitate to contact us by this web-site. We really want to offer you the opportunity to immerse yourself in the authentic Andalusia. There is wifi in the house, on the terraces and in the garden. Unfortunately there is no big oven in the penthouse, only a microwave/grill. If you would like to bake something you can however ask me and you can use my oven. Very complete and of good quality. We provide Spanish digital-TV in Spanish and original audio, international satellite-TV. The big terrace offers a panoramic view all over the village, the valley and the mountains. In winter, you can savour a relaxing sun bath, while enjoying the beauty of snow-capped peaks. The pool is a private pool on the property but shared with the guests of the two other holiday rentals. The pool area is safely fenced. Brilliant place to just stop and enjoy the locations. Accomodation was great with all amenities. Superb view. Kids loved swimming pool. Trips to surrounding villages were a highlight including food. Beautiful location. Steep approach to the house. Teenagers loved the place especially the pool. Overall a very good visit. The only negatives were thin mattresses ( after two weeks the back began to hurt!) and weak wifi. we stayed in the charming ferry tale cottage 'cortijo el potro'. the house was lovely, very comfortable and clean, nice bedding and towels, good matrasses, very spacious, well equipped. the view, outside space and covered terrace are very beautiful and idyllic. it was the perfect spot for a relaxing vacation with our two boys (aged 4 and 2). the whole property is very safe for children. the pool was absolutely perfect as it has a 'childrens' area when they could stand and also shallow steps where they could play, and a closable gate, while at the same time being very close to the terrace and house. there is a swing and playhouse with slide. We would definitely recommend this house for a family with toddlers. it is not easy to find such a toddler friendly house in this kind of idyllic setting. location is also very good: alhambra, beach, walking, mountains, charming villages, river... all within easy reach (if you have a car). the only thing we 'missed' was a dish washer. La propiedad de Oliver y María es tal cual se presenta en la información de la web. Es una bonita casa y una finca muy cuidada con numerosos espacios para relajarse viendo las montañas. La atención de los propietarios es muy buena, dado que están siempre a disposición pero a la vez son muy discretos y amables. Por otra parte el ático es totalmente independiente del resto de espacios de la casa con lo que el espacio se comparte de forma muy cómoda. La piscina y el jardín son fantásticos con numerosas tumbonas. Hay árboles, mesas de madera y bancos por varios sitios de la parcela. por lo que es un lugar perfecto para relajarse mientras se ojea un libro. En el pueblo (5 m. en coche) encuentras varios supermercados y tiendas para proveerte. Las habitaciones del ático son amplias, la cocina es suficiente, y la terraza es fantástica para comer/cenar al aire libre. Es un lugar que está bien conectado para ir a Granada y a las playas, y a tiro de piedra de los pueblos más típicos de las Alpujarras. Mitbenutzung eines schönen grossen Gartens für Badminton und Ballspiele. Sauberer Pool und herrliche Umgebung zum Wandern und Spazieren. Das nahegelegene Dorf bietet Einkausmöglichkeiten sowie diverse Cafes und Restarants zum Verweilen. Caserio El Olivo is settled in a wide and green terraced land of 3.300sqm with lush garden, surrounded by pure and calm nature and the impressive wild landscapes of Sierra Nevada but just 1km away above the town Órgiva. Although on the border of the cultivated land before it goes into the wild life, it has easy access by car and to town it only takes about 2 minutes to drive and 10 minutes to walk. The view over the village and the whole valley are wide and spectacular. The area has plenty of small familiar wine presses and cellars, producing real quality wind which can be tasted and bought right on the place. And as Spain is a gourmet's paradise which enjoys the pleasure of quality food and good wine, so varied and colourful the country, so varied and colourful the dishes. The cuisine of the Alpujarra lives from the pure and natural flavor of its autochthonous products due to the unique combination of different altitudes, temperatures, natural waters and microclimates. As such, its cuisine oozes of delicious and vibrant taste. There is a vast myriad of yummy stews including rice dishes similar to genuine paella, air-dried mountain ham, salamis, chorizos, mountain cheese, seafood, fresh vegetables and egg dishes, almond and fig pastry, and other local treats which are considered world-class foods. Many of these specialties are served as tapas (scrumptious nibbles that come for free with a drink – beer, glass of wine or sherry). Enjoy!